The month of March is upon us and that means that, once again, it’s National Nutrition Month! This year, the Academy of Nutrition and Dietetics has chosen the theme “Enjoy the Taste of Eating Right”. And what better way to enjoy the taste of healthy eating than with Isagenix®? From delicious, protein-packed meal replacement options to all the snacks and indulgences in between, Isagenix can fit into any lifestyle to encourage health and keep taste buds satisfied. It starts with healthy meals. Achieving perfect nutrition and good taste in each and every meal can be a hard thing to do sans a degree in nutrition and chef’s expertise, especially if the goal is weight loss. This is why having meal replacement options that provide fool-proof nutrition are an important part of any healthy eating or weight loss toolbox. With IsaLean® Shake and IsaLean® Pro meal replacement options that’s exactly what you get—fool-proof nutrition. Packed with 24 or 36 grams of protein, respectively, these meals provide maximum nutrition in a minimum amount of calories, and will keep you feeling full (1). Moreover, the whey protein in Isagenix meal replacement options is supported by research showing superiority to other proteins for maintaining and building muscle (2). Aside from superior protein in the right amounts, meals with Isagenix can satisfy any taste bud preference. Whether it’s sweet and creamy, something a little less sweet, or something savory that’s preferred, IsaLean and IsaLean Pro meal replacement options cover all the bases. Enjoy the Creamy Dutch Chocolate, French Vanilla, and Natural Berry Harvest flavors cold, or the warm flavor options that include Black Sesame Shake, Butternut Squash Soup, or Wild Mushroom Soup. Healthy snacks are a must. Snack time isn’t just for grade school anymore—everyone is doing it. According to data from the USDA, almost a quarter of the average adults’ calorie intake comes from snacking, while for kids it’s closer to 30 percent of daily calories with an average of three snacks each day (3, 4). The unfortunate reality is that most snacks tend to be laden with calories, the majority coming from refined sugar and saturated fat. Instead of letting snacks sabotage weight loss, choose ones you can feel good about both for taste and health. Isagenix offers a variety of snacks that, again, satisfy all taste preferences and help curb hunger. Both fiber and protein are known to delay hunger and keep you feeling full, and both are the basis for Isagenix snack options. SlimCakes® provide 5 grams of fiber, while FiberSnacks!™ contain a balance of 6 grams of fiber and 6 grams of protein. For something savory, Barbeque Whey Thins or Sour Cream & Chive Whey Thins are the best option and have 10 grams of protein. The best part is that all these snacks come in under 150 calories per serving. When something decadent is desired, there’s IsaDelight Plus™ Milk or Dark Chocolates, which are only 60 calories per serving. These guilt-free chocolate squares are also infused with green tea extract for an extra antioxidant boost. Indulging still needs to be had. Healthy eating should be the mainstay of any healthy lifestyle, but it’s also healthy to indulge sometimes. A celebratory dinner, a friend’s wedding or birthday, the holidays… these are all occasions that should not be missed because of crazy diet rules. Instead, go ahead and indulge (not too much), but follow up by performing Isagenix Cleanse Days. 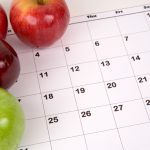 Based on the principles of intermittent fasting, Cleanse Days can be helpful tools for getting right back on the weight-loss track. Studies have shown intermittent fasting—taking a day or two to abstain from eating—can be just as effective for weight loss as simply dieting through daily restriction of calories (5). There’s no reason to feel bad about indulging a little when you know you have Cleanse Days, and Shake Days, to fall back on. There can indeed be a balance between healthy eating and tasty foods. It doesn’t have to be one or the other. With Isagenix, healthy and enjoyment can go hand in hand. And, on the occasion when indulging is the preference over healthy eating, an Isagenix system has the tools to keep you on a healthy path. It really is the best of both healthy and tasty worlds. Happy National Nutrition Month! Sebastian RS et al. Snacking patterns of U.S. adults: what we eat in America, NHANES 2007-2008. USDA Food Surveys Research Group Dietary Data Brief No. 4. June 2011. Piernas C, Popkin BM. Trends in snacking among U.S. children. Health Aff 2010; 29 (3): 398-404. Varady KA, Allister CA, Roohk DJ, Hellerstein MK. Improvements in body fat distribution and circulating adiponectin by alternate-day fasting versus calorie restriction. J Nutr Biochem 2010;21:188-95.
e+ and Cleanse Days are a perfect match. When people choose to cleanse, the No. 1 goal they have is to lose weight in a safe, healthy manner. An Isagenix system delivers with Cleanse Days that help the body detox and boost fat burning. Only, sometimes folks have trouble in completing Cleanse Days. Their reasons can include feeling too hungry, tired, irritable, or having a lack of motivation and focus. That’s where e+™ natural energy shots can come in to make cleansing easier. Feeling hungry? e+ ingredients can help curb cravings. How it does so has partly to do with the shot’s content of caffeine supplied by yerba mate and green tea. Growing evidence suggests caffeine is useful for reducing the desire to eat—for a limited amount of time—although it’s wise not to overdo it (1, 2). An added plus is that caffeine and green tea antioxidants can help stimulate thermogenesis, which could help you burn at least a few additional calories per day (3, 4). Feeling tired? Partly due to caffeine content, but also the adaptogens, the shot helps wake cleansers up. Studies looking at adaptogens, such as eleuthero and rhodiola, find that they fight fatigue by helping to normalize the body’s response to stress (6-12). In this way, e+ gives cleansers sustained energy and keeps them from hitting the wall. The wall, in this case, might be a tempting bag of chips. Not in the mood? e+ can help with that too. Addressing the problem with the combo of caffeine and adaptogens can help correct any feelings of stress or irritability (7, 8, 13, 14). No need to lash out against innocent bystanders on Cleanse Days. Instead, enjoy an e+ and share the shot with those good people. Down on cleansing because of a lack of motivation or trouble concentrating? It might just be because of hunger. Being hungry brings on “brain fog”. The solution—you guessed it!—is a shot. Studies show that a little sugar (such as from e+’s natural juices) combined with caffeine and adaptogens can work together to help increase concentration (8, 10, 13, 14). Take a shot: think clearly on Cleanse Days. Blood sugar lows? Having e+ handy for boosting blood sugar may not be a bad idea for some people. Low blood sugar may affect some people while on a Cleanse Day. To avoid an episode, the typical recommendation from doctors is to eat or drink something right away with quickly absorbed sugar in it like fruit or fruit juice. Those with hypoglycemia, severe hypoglycemia, or diabetes are advised to discuss their personal situations with their physicians before trying a Cleanse Day or any nutritional product. But will e+ interfere with cleansing and what about the extra calories? Both these questions have come up in relation to e+’s use on Cleanse Days. For these reasons, Isagenix performed an in-house pilot trial. 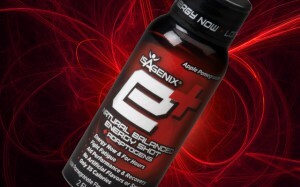 The results were that e+ did not interfere with the effectiveness of the Isagenix system. In fact, the subjects in the trial who used e+ showed a positive trend toward greater weight loss compared to those who didn’t use the product. In short, the benefits of the adaptogens and natural caffeine should eliminate any concern about the minor addition of calories on Cleanse Days. F. Facchinetti et al. Eleutherococcus senticosus reduces cardiovascular stress response in healthy subjects: a randomized, placebo-controlled trial. Stress Health. 2002 Feb; 18 (1): 11–17. Dr. Dennis Harper speaks on stage as part of the Health Panel at the 2013 Celebration event. If you were at the Isagenix 2013 Celebration held in Las Vegas last month, then you may have been present for the Health Professional panel involving Chief Science Advisor, Suk Cho, Ph.D., and esteemed doctors and scientists who use Isagenix and recommend the products to their patients. Dr. Cho and the panelists offered some great discussion on various health topics, one being the American Medical Association’s recent decision to define obesity as a disease. Whether it’s Dr. Messina or Dr. Harper who is in the right, only time will tell. But there seems to be two commonalities both doctors agreed upon—health professionals play a major role in the fight of obesity and Isagenix is the perfect tool for success. While diet pills and fad diets claim to be the obesity solution, science supports healthy lifestyle changes and balanced diets that people can adhere to for the long-term—exactly what Isagenix offers. Already, there are plenty of doctors who use Isagenix in helping their patients live healthier lives. It’s a natural fit— health professionals providing healthy products. Refer to the two peer-reviewed articles about the UIC study in Nutrition Journal and in Nutrition and Metabolism. Demonstrate that the results found in subjects using the Isagenix system were superior to those following the “heart healthy diet” across all parameters. Don’t forget to show the MRI images illustrating greater loss in visceral fat—this is a compelling finding! Sharing the results of the clinical study with health professionals can open their eyes to the credibility of Isagenix products. With doctors playing a major role in tacking the obesity epidemic, it’s our responsibility to provide them with the most effective and safe tool—Isagenix. One of my college profs used to pile on the projects, meeting our groans about sleep with, “Five hours for a lazy man.” He seemed to thrive that way, very fit, legendary for his 6 a.m. workouts at the Uni gym. I never got up that early, but often noticed his office light when leaving the library after it shut at 10 p.m. He died of a stroke aged 64. His death made me take a good look at sleep research. Studies cited in my little book, Sound Sleep (1), and numerous other reviews (2,3) show that fewer than seven hours sleep a night promotes increased risk of chronic health problems and growth of visceral fat. Sleep is a circadian (24-hour) physiological rhythm, essential lifelong for more than 100 physiological processes, including brain growth, memory, and cellular restoration throughout the body. Because of the revolution of the Earth, sleep is programmed into our DNA and controlled by melatonin in the brain which switches on at night and off with the break of dawn. The night-time sleep cycle controls the physiology of one-third of your life, and largely determines your health in the other two-thirds (4). The majority of Americans just don’t get it. 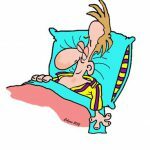 The National Sleep Foundation reports that 63 percent of Americans, almost 200 million people, get insufficient sleep. No wonder most of us are sick and tired (5). Like my old prof, you can easily cut your sleep, and tell yourself you don’t need much. You can also down a bottle of whiskey a day and tell yourself you have a titanium liver. You can follow any number of unhealthy practices, but I wouldn’t give much for your chance of seeing your grandchildren graduate from college. I trust most of us are decades away from the reaper yet, but here’s the sleep crunch. If you’re struggling to improve your body and mind, or working through an Isagenix 30-day Program and not getting super results, sleep may be the problem. Poor sleep can cancel out all the health benefits of even the best diet, exercise, and supplement program.(6). Permanent fat loss is a prime goal for many folk who consult me. No hope without sufficient sleep. In 2004, research at the University of Chicago first showed that poor sleep reduces the brain’s ability to regulate hormones that control hunger. Subjects let sleep only four hours a night for just two nights showed an 18 percent decline in leptin, the main hormone that turns off appetite. They also showed a 28 percent increase in ghrelin, the main hormone that triggers hunger and cravings for quick-sugar, high-carb foods (7). Two summaries of recent studies, one in the British Medical Journal, and the other by world famous sleep researcher Dr. Russell Reiter, extend these findings. We know now that poor sleep causes severe damage to sugar and insulin metabolism, and a large drop in human growth hormone, the so-called “youth hormone”. Sleep deprived subjects not only eat more carbs, and gain more visceral fat, they also lose muscle, look haggard, look years older, and — nasty of nasties — develop irreversible saggy skin (8, 9). So what has this to do with your cell phone? Simple. Waning of the light at night stimulates a nerve pathway from the eye to parts of the brain that release melatonin to control the sleep-wake cycle. Light at bedtime from a cell phone, tablet, E-reader, or computer suppresses melatonin release. To produce white backlight, these devices emit blue light at short wavelengths, right at the peak sensitivity to suppress melatonin (10). So there you lie, eyes like holes burned in a blanket, cultivating your muffin top. If you just love to phone or text in bed, there are solutions. Keep your bedroom cool, and really dark. Once in bed use an amber night light. Amber enough to just see by does not affect melatonin. You can also use the software program that automatically changes the light of your device towards amber at night and blue during the day. Not perfect. So also use the unique Isagenix Sleep Support & Renewalspray to top up your melatonin. Sweet dreams will beat that muffin. 1. Colgan M. Sound Sleep. American Fork Utah: Sound Concepts, 2012. 2. Blask DE. Melatonin, sleep disturbance and cancer risk. Sleep Medicine Reviews, 2009;13 257–264. 7. Spiegel K, Tasali E, Penev P, Van Cauter E. Sleep curtailment in healthy young men is associated with decreased leptin levels, elevated ghrelin levels, and increased hunger and appetite. Ann Intern Med. 2004 Dec 7;141(11):846-50. 10. Wood B, et al. Light level and duration of exposure determine the impact of self-luminous tablets on melatonin suppression. Applied Ergonomics 2013 Mar;44(2):237-40. doi:10.1016/j.apergo.2012.07.008.